The Colorado Rockies visit Kauffman Stadium on Wednesday, August 23, 2017 to play the Kansas City Royals. The probable starters are Antonio Senzatela for the Rockies and Ian Kennedy for the Royals. The opening line for this matchup has Colorado at +103 and Kansas City at -113. The Rockies have a 51-67-6 over/under record and a 63-61-0 run line mark. 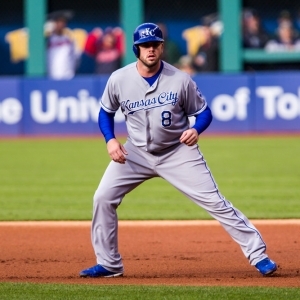 The Royals are 61-62-0 against the run line and have a 58-59-6 over/under record. The Rockies have a 68-56 overall record this season. Starting pitcher Antonio Senzatela has a 10-4 record with an earned run average of 4.56 and a WHIP of 1.24. He has 89 strikeouts over his 116.1 innings pitched and he's given up 105 hits. He allows 8.1 hits per 9 innings and he has a FIP of 4.72. The bullpen has an earned run average of 4.55 and they have given up 409 base hits on the year. Teams are hitting .256 against the bullpen and they've struck out 409 hitters and walked 162 batters. As a team, Colorado allows 9.1 hits per nine innings while striking out 7.9 batters per nine innings. They are 22nd in the league in team earned run average at 4.66. The Rockies pitchers collectively have given up 1,115 base hits and 571 earned runs. They have allowed 155 home runs this season, ranking them 14th in the league. Colorado as a pitching staff has walked 422 batters and struck out 970. They have walked 3.4 men per 9 innings while striking out 7.9 per 9. They have a team WHIP of 1.39 and their FIP as a unit is 4.46. Kansas City has a 62-61 overall mark this year. With an earned run average of 5.06, Ian Kennedy has a 4-9 record and a 1.27 WHIP. He has 105 strikeouts over the 122.2 innings he's pitched. He's also given up 107 hits. He allows 7.9 hits per nine innings and his FIP stands at 5.26. The bullpen has an earned run average of 4.13 and they have given up 408 base hits on the year. Teams are hitting .251 against the Royals bullpen. Their relievers have struck out 384 batters and walked 172 opposing hitters. As a team, Kansas City allows 9.1 hits per nine innings while striking out 7.7 batters per nine innings. They are 14th in the league in team earned run average at 4.43. The Royals pitchers as a team have surrendered 1,110 base knocks and 540 earned runs this season. They have given up 141 home runs this year, which ranks 24th in Major League Baseball. Kansas City as a staff has walked 385 hitters and struck out 943 batters. They give up a walk 3.2 times per 9 innings while they strike out 7.7 per 9. Their team WHIP is 1.36 while their FIP as a staff is 4.25.